By joining metal surfaces, the O-Ring works as a seal through the mechanical twist of the electrometric composite. The pressure which moves the ring is derived by the mechanical pressure, squeezing of proper gland design, the selection of the material, and by the system pressure sent in by the liquid itself. The ring does the sealing through the deformation of the seal material by installation and media pressure, thereby closing the gap between mating components. However, high pressures can cause deformation through the gap, known as extrusion, which results in seal failure. There are two types of O-Rings: Static O Ring and Dynamic O Ring. Static Seal is the one which does not move, except for pulsation caused by cycle pressure. Dynamic seals are those seals that are subjected to movement. 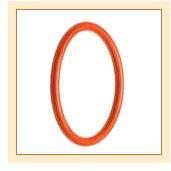 O-rings are successfully used in both static and dynamic applications. The cross section of the ring is squeezed axially in the groove which is similar to a flat gasket. The cross section of the ring is squeezed radially in the groove, between the inside (ID) and outside (OD). It is also axially squeezed in a dovetail groove. It is used for sealing straight thread tube fittings. The seals or rings are used in applications that slide back and forth. This motion introduces friction that leads to creating designs different from those of static seals. Dynamic applications of O Rings are seen in both rotary and reciprocating movement. These rings are used in a variety of other applications such as wipers, buffers, and drive belts.